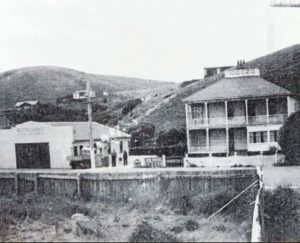 This photo above from 1938 shows the recently built Reith’s Garage (the site of Plimmerton Motors) and Tangi Moana with its widow’s walk railings still in place. Below is the house today. Still with many original features, and still with its large section. Just metres from the endless traffic flow of State Highway 1 is a century-old home that was originally built as a seaside retreat. Tangi Moana (“crying sea”) was the beach house of the Kirkcaldie family of Wellington, best known for the Kirkcaldie and Stains department store. Today the old home still stands, virtually in its original condition, and is owned by Helen Pearson and Janet Fenton – just the second family of owners in 112 years. 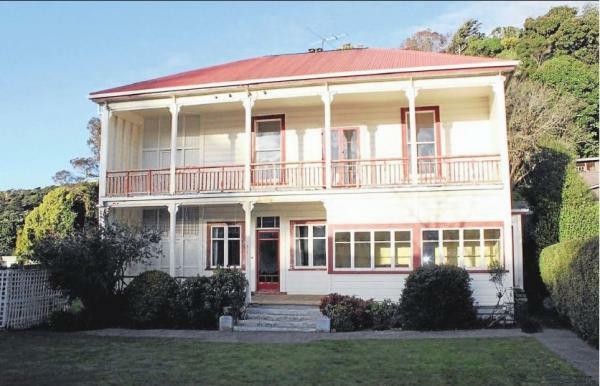 It is an enormous two-storey home, recognised by the Porirua City Council as a heritage building, but it is a treasure that few people notice. Designed to be a holiday house for quiet weekends at the beach in Plimmerton, it is ironic that it now sits at the edge of one of the busiest roads in the country. It was built to accommodate summertime Kirkcaldie family gatherings and, in keeping with the architectural times, has a widow’s walk on the roof. The widow’s walk was so named because when there was a fisherman in the house the wife was able to get access to the roof to be able to see if her man was returning safely from sea or whether she was now a widow,’’ current owner Helen says. An iron fence around the widow’s walk is clearly visible in photos taken just after the home was completed in 1898 and the Kirkcaldie family used the roofline walk to enjoy the sea air and views of Mana Island. The huge old home’s beginnings are first noted in the Kirkcaldie and Stains history published as A Wellington Story. When the renovations at ‘‘Kinnoull’’ were completed, John and Mary Kirkcaldie treated the entire retail staff to a garden party. Surplus building materials from the house and store renovations were then used to build Tangi Moana at the south end of the beach at Plimmerton. According to his children, this two-storey beach house was one place where John could really relax. With the opening of the Paremata Bridge and expectation of increased traffic flow the Kirkcaldie family sold the home in 1938 to Helen and Janet’s grandfather, Alexander Reith. For Mr Reith, a Paekakariki Hill Rd farm manager and mechanic, the opportunity was outstanding. He moved his wife and son into the home and immediately built a workshop and garage over the tennis court in front of the big home. ‘‘Pop [grandfather Reith] and Dad went into business. Reith’s Garage opened in 1938, the year they bought the house, so no time was wasted,’’ Helen says. It was a perfect partnership. As an only child Sandy Reith had been sent to Scots College to get a quality education but in later life he used to tell people the only things he did at Scots College were to fix the master’s car and the boiler. He was a born mechanic, never an academic. To help pay the substantial mortgage on the home the ground floor level of the old house was rented out. Even today the house remains as an upstairs and downstairs flat, each with a separate kitchen, bathroom, living room and bedrooms. Other than dividing the old home into flats little was changed at Tangi Moana. Even now the scrim and wallpaper remains, painted over, with just a couple of rooms gibbed. The native timber flooring is exposed on the room verges – carpet, in varying states of repair, only covers the centres of each room. Each level has a 12-foot stud, including the roof space between the ceiling of the second storey and the roofline. The original ladder to the widow’s walk remains but the iron fence has long gone. ‘‘I had wanted to climb up into the roof space for 40 years, since I grew up in the house and spent my teenage years in the room with the manhole in the ceiling,’’ Helen says. She has mixed memories about growing up in the huge old house. The ground floor was her family home and her grandparents lived above on the second storey. The property still has a double section, more than 1400 square metres, an area that used to have a substantial orchard and vegetable garden. ‘‘Pop was a wonderful gardener, he even grafted one apple tree so it produced cooking apples and two different sorts of eating apples off one tree. The home is a massive 480sqm, excluding the verandahs which are each over three metres wide. Even the woodshed at the side of the house is over 23sqm, but Helen says, with two open fires and an expanse to heat, plenty of firewood was used over the years. In 1938 when Mr Reith purchased the house he enclosed three of the verandahs, one upstairs and two downstairs, to create more bedroom space. They remain covered and Helen says they have made very useable areas. Today both Helen and Janet live elsewhere and since their mum died in December they are considering their options. The garage at the front of the home still operates, now called Plimmerton Motors, 72 years after the garage first opened for business.